As a child, I had learnt the phrase “as free as a bird” and heard it being used often and very casually. It was just another simile. Never did I have a second thought about what it actually meant. Or what it truly felt. When we got transferred to Kenya, almost on the heels of the massacre at the Westgate Mall in Nairobi, much to the surprise of our friends in Singapore, we happily packed our bags and prepared ourselves for the adventure that we were sure lay ahead of us. Like most Bengalis, who had grown up reading Chaander Pahar, we had always been fascinated by Africa. It was never the Dark Continent but a magical and mysterious place. So much so that even before finalizing a school for our daughter or looking for a house, we set off for Maasai Mara right after landing at Jomo Kenyatta Intl airport at Nairobi! The first thing that hit me when I landed at the Mara airstrip was the vastness of the landscape. As we were driven through the reserve by Edward (my first African wild life guide and teacher), I looked around me in wonder. The endless rolling plains, with its sun-bathed red soil, seemed to be painted in myriad shades of brown, red, green and yellow. The mesmerising play of light and shadow on the greens and yellows, with a sudden odd appearance of a lone acacia that is so typical of the Mara landscape. And THEN I saw the birds….. swallows, weavers, babblers, canaries, chats, cisticolas, doves, larks, longclaws, robins, rollers, pigeons, chirping happily and flying, gliding, sailing, whirring, soaring, flitting, skimming, drifting, circling, hanging, lazing…. sometimes even doing a figure of eight, well, almost. Birds of prey like eagles, buzzards and kites hovering, swooping, plunging…. And the scavengers watching and waiting ever so patiently. How beautifully the little birds cruised through the air without a care in the world! No concrete structures to be terrified of crashing into, no pesky kids to be wary of, no electric wires or poles to be cautious of, no obstructions or traps anywhere. Till then, I was clueless about birds. They were just little feathered creatures who made some noise and flew around us. My knowledge was limited to crows and sparrows. I also knew that the dodo was extinct. And the kiwi was a flightless bird. Maara changed all that. In a moment, I realized the joy of being born free along with the meaning of living free and forever free. I squirmed to think of all the birds that are kept caged as pets. Of the feelings of all the animals living in a zoo enclosures. And of the social dolphins trapped in marine parks. If only people could make one trip to Africa to witness the unbound joy in their life in their natural habitats, they would learn a real lesson in conservation. And what a crime it is to keep them captive for our selfish voyeuristic pleasures. That day I discovered what it truly feels to be as free as a bird. And I continue to learn every day…. 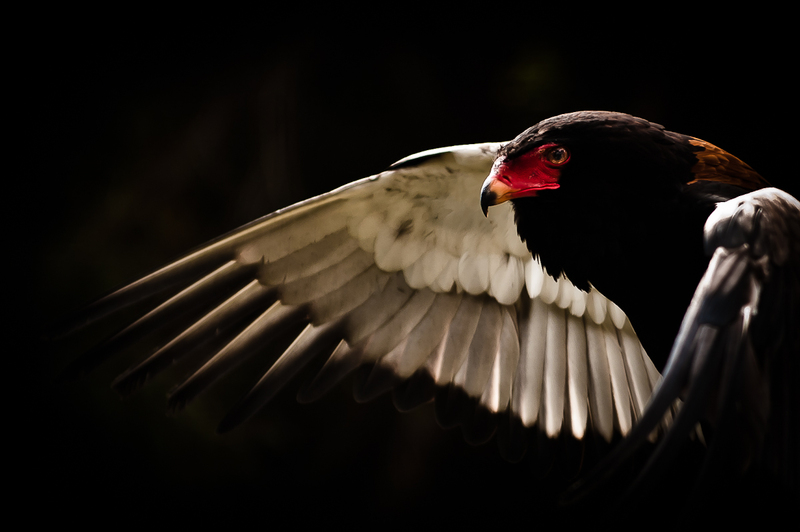 PS: To see the Bateleur Eagle in its full glory, click on this link.